Learn how to change the text and background colours for web pages you visit to make them more readable. In the still-open Internet Options box, use your mouse to select the Colours button or press Alt and O on your keyboard. 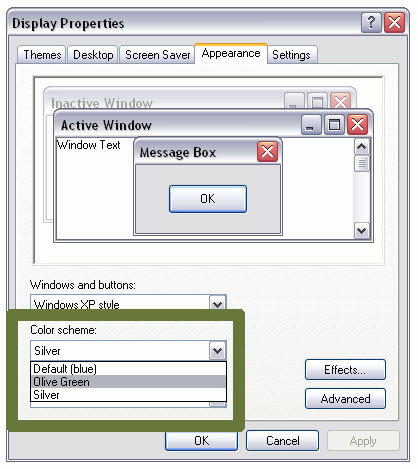 Uncheck the default “UseWindowsColours” option. 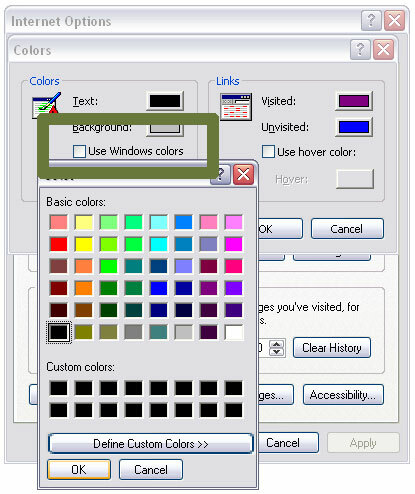 Use your mouse or the arrow keys on your keyboard to select your preferred text colour. Repeat for the background colour. 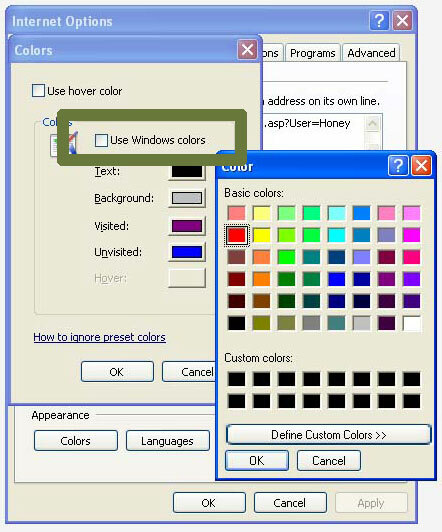 Uncheck the default “Use Windows Colours” option. Use your mouse or press Alt and W on your keyboard to de-select the check mark. Use the mouse or use the arrow keys on your keyboard to select your preferred text colour and press the Spacebar to select. Repeat for the background colour (Alt and B), visited links (Alt and I) and unvisited links (Alt and N), if desired. 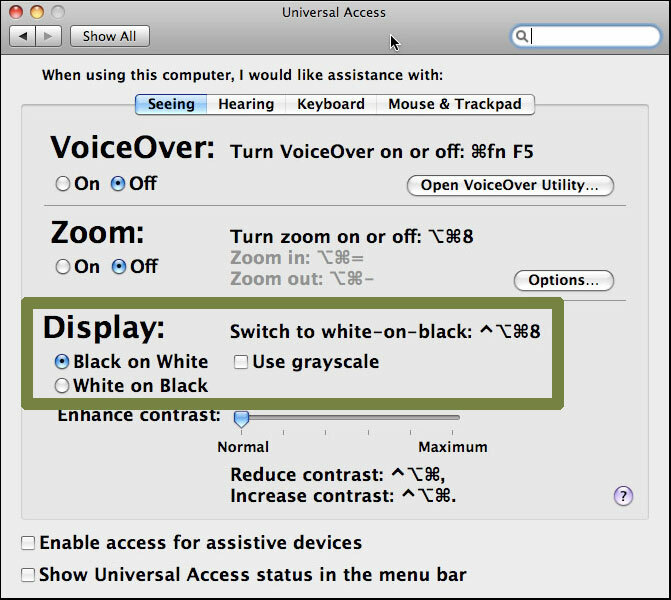 To remove all colours from your display, use your mouse to click on the Set Display to Grayscale button or use the tab key repeatedly to highlight the Set Display to Grayscale button and press the spacebar. 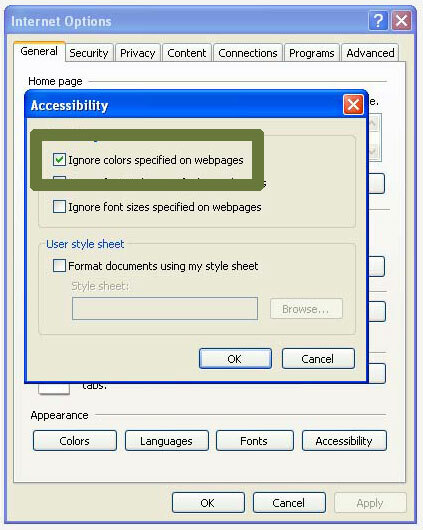 When you are happy with your colour scheme, use your mouse to click the red Close button at the top left of the Universal Access window or press Command and W to close the window. 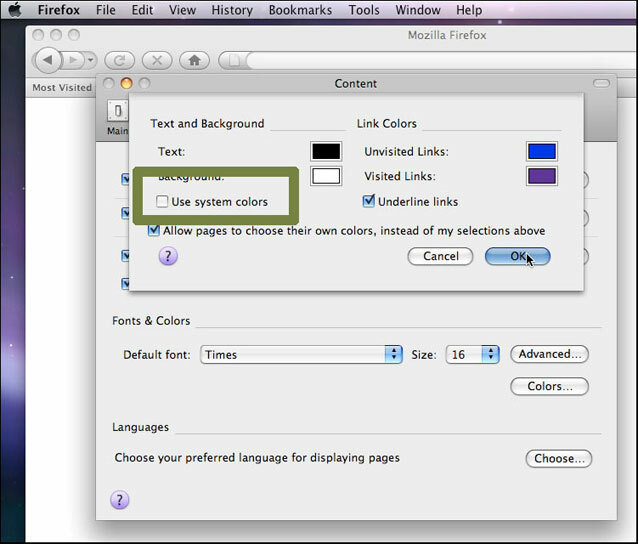 If you do not want to use the Mac OS system colors, use your mouse to click on the coloured boxes next to Text, Background, Unvisited Links and Visited Links to select a new color for each. Alternately, use the tab key to highlight the coloured boxes next to Text, Background, Unvisited Links and Visited Links and then use the arrow keys to highlight a new color for each. Press the spacebar to select that color. 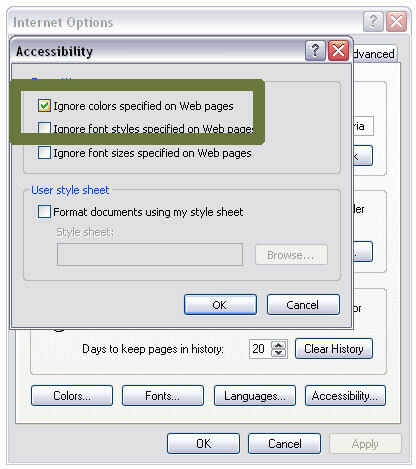 Use your mouse to click on the Allow pages to choose their own colours checkbox so that the checkmark disappears, or by using the tab key to highlight the Allow pages to choose their own colours checkbox and pressing the spacebar until the checkmark disappears.